While the stock market was off to a great start in 2017, showing gains of about 5.4% during the first quarter, prices have been slowly trending downwards ever since. The recent North-Korea related tensions and terrorist attacks in Spain did little to help investor sentiment. Consequently, August marked the fifth consecutive month of losses for a Euro-denominated MSCI All Countries index. Ever since reaching its top in March, this commonly used benchmark has lost more than 3% of its value. Admittedly, few people have lost a fortune, and the losses are driven to a greater extent by currency effects rather than by stock-price effects. After all, macroeconomic data isn’t looking too bad: GDP growth in Europe and Japan has been considerably higher than expected. Vector Navigator has been outperforming during both the up and downswings this year, as illustrated in the below graph. Year-to-date our 100% equity fund has achieved a return of 6.8%, which compares well to the MSCI’s 2.1% performance. We are outperforming the index with 4.7%, and the Morningstar Category with 5.4% since the turn of the year. Given the lackluster performance of equity markets this year, Vector Flexible isn’t that far behind Navigator. With a return of 6.7% it is outperforming 92% of its competitors in the Flexible Allocation category (and the same is true for Vector Navigator). The consistently good performance of our funds hasn’t gone unnoticed in the press, where Flexible was introduced as one of the best performing flexible funds by De Tijd in an article dubbed “Flexibele fondsen op de afspraak”. In another article in the same journal, we got to pick 5 stocks which we think will outperform, just as we did last year. 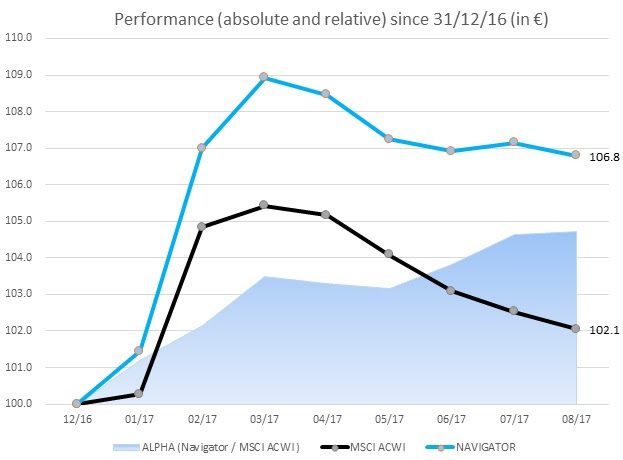 Our picks of 12 months ago outperformed the market with an average of 7%, which is close to the outperformance Navigator achieved over the same period.